The $15,990 2014 Nissan Versa Note SV becomes an SL by checking the SL Package box ($1,700). If you name a car the “Note,” expect car reviewers to run for musical metaphors to work into their commentary. Here goes: The Nissan Versa Note is far from being a soaring automotive symphony. It’s more of a snappy tune to whistle while you work. As the hatchback companion to the Versa sedan, albeit with different styling, the Note delivers fine small-car cargo capacity that’s easy to access, and it’s quite friendly to people, too, especially in the back seat. But the duet performed by the SV’s standard 1.6-liter dohc 4-cylinder engine and continuously variable transmission is adagio on the highway. Ride isn’t exactly one of its greatest hits, either. Nissan turned to weight- and drag-reducing techniques to make the 2014 Note a more-frugal-to-feed proposition. It’s EPA-rated at 31 mpg in the city and 40 on the highway. This driver logged exactly 162 miles in our test Note SV and averaged 31.32 mpg, with 63 percent of those miles under city driving conditions. Interior materials are sturdy, but not particularly posh. Hard plastics abound and seats are cloth-only, but at its $15,990 price point, the SV adds a leather-wrapped steering wheel with built-in radio controls, a height-adjustable driver seat, power windows and door locks, remote keyless entry, and a wireless cell-phone link. Our tester was enhanced with a couple of option groups: the SL Package (multi-format audio display, satellite radio, USB port with iPod control, rear cup holders and storage bin, rear-seat arm rest, adjustable cargo floor, 16-inch alloy wheels, fog lights, variable intermittent wipers, heated front seats, and push-button ignition) and the SL Tech Package (“around-view” monitor, heated exterior mirrors, and NissanConnect with navigation on a 5.8-inch touch screen and voice recognition, traffic and weather information, and Pandora radio and Bluetooth streaming-audio capability). Even with these substantial add-ons and delivery, the bottom-line price was $19,280. If you’re looking for useful convenient but low-cost transportation, that ought to leave you with a song in your heart. 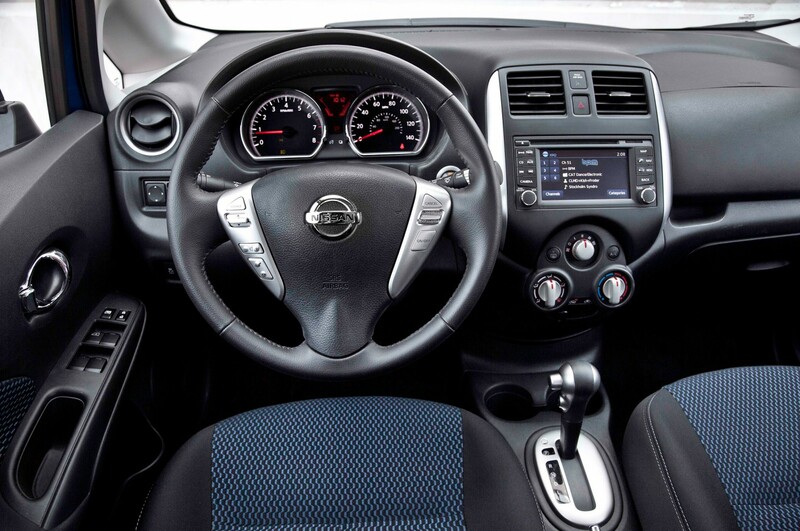 Versa Note’s feature-laden cabin looks nice, but hard plastic is the material of choice for most surfaces. Although the base S and mid-level S Plus versions of the 2014 Nissan Versa Note are rather “stripped” by today’s standards, the top-line SV has all the expected features at a price that looks good even against smaller subcompact rivals. The SV also offers some rare-for-the-class options such as Nissan’s nifty Around View 360-degree camera, along with popular connectivity features. Even more equipment can be had by ordering your car with the SL Package, which includes a number of luxury-level features for a tidy, but not excessive, sum. Power can feel meager at higher speeds and interior materials don’t impress, but if interior room, cargo space, and high fuel economy are tops on your list, the Versa Note is a must-see. Allow me to just belch out the bad stuff first: This car is loud when pushed, somewhat underpowered, and the cabin lined with scratchy hard plastic. That said, I can away from the Note mostly impressed. The power issue only really matters when merging onto the highway or trying to pass at speed. The cabin actually looks fine, there just isn’t a soft surface anywhere. As for the noise, it’s not excessive, and less-than-aggressive drivers are less likely to hear it than the lead-footed crowd. One the plus side, this car seats for large adults in comfort, easy easy to see out of, and is something of a bargain, Our jam-packed test car came to almost $20,000, but that price included the automatic transmission, a navigation system, power everything, heated seats, satellite radio, nice-looking wheels, fog lights, high-end traffic and weather alert features, and Nissan’s cool Around View Monitor system. 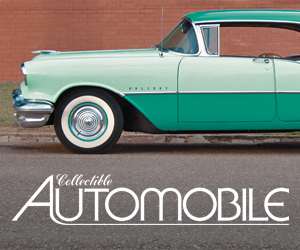 Shoppers with a keen eye for dollar value looking for a nice ride that’s easy on the gas will find a lot to like here. I would suggest that folks who spend a lot of time on the highway might want to look elsewhere, as wind and road noise are not insignificant. 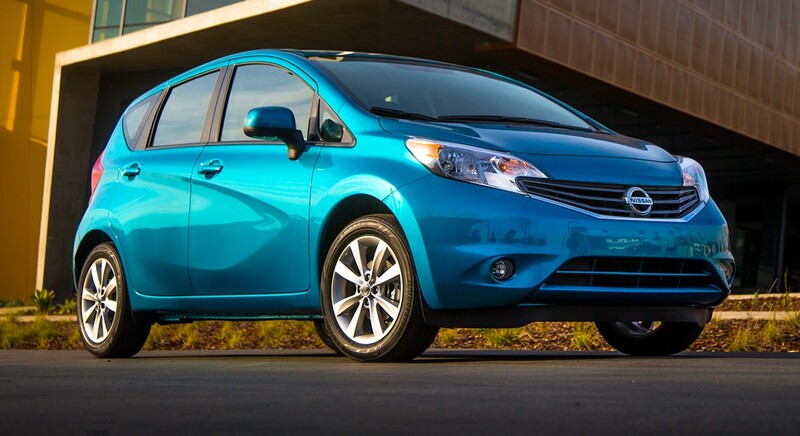 Urban dwellers looking for a deal, however, should add Versa Note to the short list. 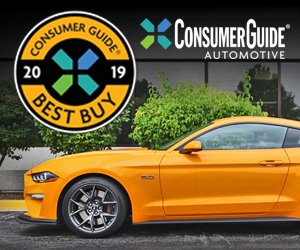 Written by: The Daily Drive staff on October 10, 2013.on January 29, 2019.